You may be contemplating undergoing dental implant treatment and need to know, “are dental implants safe“? Even though the treatment has been shown to be highly predictable with success rates in the region of 95%, the question are dental implants safe can be looked into in more detail. What materials are implants made from and how do they behave in our mouths after being implanted into the jaw bone? 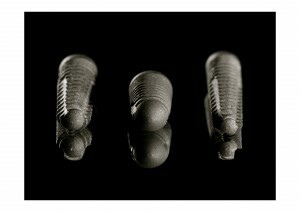 Most implants used in dentistry today are made of commercially pure titanium or titanium alloys. Zirconia variants do exist however their use in dentistry is less common. Dental implants are used to replace missing or damaged natural teeth. The implant replaces a natural tooth root and is able to help support, dental crowns, dental bridges or stabilize removable dentures. The benefit of having dental implants is that once completed, the new teeth feel and look just like natural teeth. The actual surgery can be carried out under local anesthetic or IV sedation (for anxious patients). The implant is then left in the jawbone for about 4-6 months while healing takes place. This fusion between the bone tissue and the titanium is known as osseo-integration. The new teeth are custom designed and shaded to aesthetically suit each patient’s requests and dental needs. 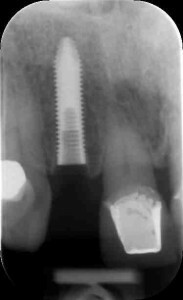 Unlike crowns and bridges dental implants do not damage adjacent teeth during preparation of fixed bridgework. Dental implants also prevent further bone loss which happens after losing natural teeth. If properly maintained implants can last up to 15-20 years. It was initially thought that bone would shrink about 0.5mm-1mm around implants per year however newer designs are kinder to surrounding bone and are showing very little bone loss at all. What about allergies to metals? Are dental implants safe ? Titanium is the most commonly used material. Although other metals have the potential to corrode and release harmful ions which could induce allergic responses, titanium is known for its exceptional resistance to corrosion and high bio-compatibility in the mouth. In studies carried out on orthopedic titanium implants symptoms from titanium allergies led to skin rashes and even implant failure. The incidence of allergic reactions to titanium has not been well documented and is extremely rare. According to the MELISA foundation, titanium allergy is barely recognized in mainstream medicine – yet laboratories using the MELISA® technology have reported that about 4% of all patients tested will be allergic to it. It is very possible that zirconia may become a more popular choice of implant material in future. The material has been used in other areas of the body with promising results however its use is still limited and further studies are being carried out. For further information about zirconia see Ceraroot Zirconia. Factors to consider before Dental implant treatment. The capacity and ability of the surgeon or clinic carrying out the surgery and prosthetic treatment. An experienced surgeon is more likely to be better prepared for possible complications which may arise during treatment. Has the surgeon carried out in depth planning prior to implant surgery. Use of radio-graphs and CT scans will reduce possible serious complications, errors of incorrect implant placement and reduce chances of dental implant failure. Thorough understanding of the treatment plan, how many appointments are needed and what are the possible risks and complications of treatment. Understanding of consequences if not going ahead with treatment. As discussed above missing teeth will lead to further bone loss. This additional bone loss could make treatment in future more complex due to limited bone. Choose a clinic which is convenient to visit. Implant treatment is a lengthy process and traveling abroad can be inconvenient especially if complications were to arise. Factors to consider after Dental implant treatment. Oral hygiene and maintenance, implants need to be looked after and correctly maintained. Poor oral hygiene can lead to early failure. Regular visits to your dentist and hygienist to make sure that the implants, teeth and mouth in general are healthy. Early detection of any problems is best treated as soon as possible. 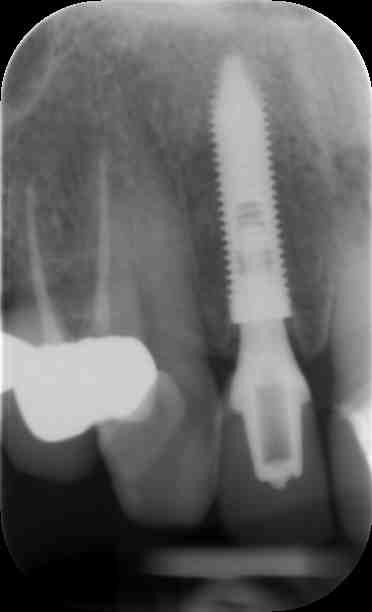 Implants can fail, in 3-4% of cases failure may occur and treatment may need to be carried out again. Patients who are heavy smokers and those with chronic illnesses are more likely to experience failures compared to fit and healthy non smokers. Conclusion- Are dental implants safe? The reality is that there is no procedure that is carried out in clinic or hospital that is entirely risk free. However dental implant treatment is considered to be one of the most predictable treatments in dentistry today. Anyone interested in implant treatment should seek advice and treatment from experienced surgeons in the field of dental implantology. 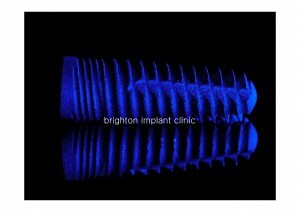 Brighton Implant Clinic is a dental implant clinic in East Sussex. Our team of experienced surgeons would be delighted to provide further information if required feel free to Contact Brighton Implant Clinic. I’ve observed some individuals who have undergone dental implants and in some cases have observed grey outlines under their gum tissue is this due to the titanium implants? Would Ziconium implants not have this problem? zirconium dental implants have no grey metal hence it would be less likely for any grey areas to be seen under gum tissues. In some instances it is possible to see greyness around metal ceramic crowns ( can be on implants or natural teeth ) We find that using metal free crowns with zirconia abutments can reduce the chances of metal showing through gum tissues or around the margins. Thank you for your inquiry, we had an issue with replies on our website hence this late reply. If you wish to contact our clinic please call us on 0844 815 1414 or click on this link here to book an appointment.